Over the years the Western press named a number of cosmonauts that were never acknowledged by the Soviet Union. Most were said to have died in space. One allegedly was the first man in orbit and survived. What is the truth of these stories of 'phantom cosmonauts'? During the lifetime of the Soviet Union the details of their space program were kept completely secret. The real identities of their rocket and spacecraft engineers were never revealed until after they died. The fact that a pilot was training for space flight was kept secret even from his wife until after they had actually been launched into space. The enormous project to land a Russian on the moon was kept utterly secret until after the fall of the Soviet Union. In the absence of hard information the Western media naturally had to rely on the rumour mill and perhaps their own inventiveness. Manned flights were normally claimed to be completely successful, even when it was obvious that the planned objectives were not met. There were exceptions to this. Manned launches were announced after they had achieved orbit, not after they had successfully landed. This meant that the deaths of cosmonauts in space had to be acknowledged and became the subject of national mourning (e.g. Soyuz 1 and Soyuz 11). Manned launch aborts were also acknowledged, though with some delay (e.g. Soyuz 18-1 and Soyuz T-10-1). A Bolshevik practice since Lenin's time was to erase from photographs and history persons who had fallen out of favour. In the most infamous example a photograph of Lenin speaking in on May 5, 1920 was slowly depopulated over the years as one trusted comrade after the other turned out to be an enemy of the state. The Soviets helped along the rumours of cosmonaut deaths through imperfect censorship. Since the identities of unflown cosmonauts were secret, they would be airbrushed out of group photos of cosmonauts. Several versions of the same picture might appear, with or without these 'phantoms'. In the earliest years of the space race it was claimed by the Western press that a number of Russian cosmonauts died in space flights that were never announced by the Soviet Union. Coming from a very few original 'unidentified sources' these were embellished and elaborated by other writers over the years. Sensational allegations by the Judica-Cordiglia brothers. Italian amateur radio buffs, added some substance to the allegations. After the fall of the Soviet Union the curtain of secrecy was partly lifted. The diaries and memoirs of Soviet managers, cosmonauts, and engineers at the centre of the space program were published. Personal and official documents, diaries, and contemporary notes from the time were sold at auction and purchased by Western museums and institutes. The Soviet Union's greatest secrets - the failed moon landing program, the Nedelin disaster, the horrible radiological and biological warheads developed for their missiles - came spilling out. Several cosmonauts who had died in training accidents were indeed identified. But there was not a shred of confirmation of the original phantom cosmonaut stories in any of this new information. In recent years the Internet has spread further stories of phantom cosmonauts and astronauts. These were derived from modern art projects, garbled versions of books and television programs, and circulation of Muscovite urban legends. Presented for your consideratoin is a list of known Phantom Cosmonauts (and a few astronauts), the origin of their stories, and what truth might lay behind it. In particular the truth behind the alleged first man in space - Vladimir Ilyushin is examined in some detail. And revealed here for the first time - some phantoms actually did fly on Soviet manned spacecraft into earth orbit and around the moon - but they weren't human! Many thanks to Dietrich Haeseler, Jens Kieffer-Olsen, Dr. Elliott H. Haimoff, Larry Klaes, James Oberg, Sven Grahn, Colin Burgess, and Dwayne Allen Day for their assistance and suggestions. Schroeder German test pilot, alleged to have been killed on 24 January 1945 in the launch of an A9/A10 ICBM targeting New York. An Internet legend spawned in the 'Nazis-On-The-Moon-Milieu' in the 1990's. Ledovskiy Russian phantom cosmonaut. In 1959 Italian news reported a series of cosmonaut deaths on suborbital flights, among these Ledovskiy. No historical evidence ever emerged of any Soviet suborbital flights. Shiborin Russian phantom cosmonaut. Oberth claimed in 1959 that a pilot was killed on a sub-orbital flight from Kapustin Yar in early 1958. Italian press linked Shiborin name to this flight. No other evidence. Gromova Russian phantom cosmonaut. Soviet test pilot said to have flown a 'space airplane' into oblivion 1959.12. No evidence ever surfaced in post-Glasnost Russia to back up the claim. Mitkov Russian phantom cosmonaut. In 1959 Italian news reported a series of cosmonaut deaths on suborbital flights, among these Mitkov. No historical evidence ever emerged of any Soviet suborbital flights. Zavadovski Russian phantom cosmonaut. Phantom cosmonaut. 1959 Moscow newspaper showed a Zavadovski testing high altitude equipment. Later presumed to have died on Korabl Sputnik 1 in May 1960. Kachur Russian phantom cosmonaut. Said to have died in October 1960 in first attempted Soviet manned flight. Linked to model Khrushchev was to have revealed at UN. In fact, model was of Mars probe that failed. Graciov Russian phantom cosmonaut, alleged sender of a Morse code radio message from deep space received by the Judica-Cordiglia brothers on 1960.11.28. In fact Russia would not have a large enough booster for such a mission until 1968. Mikhailov Russian phantom cosmonaut, said to have died 1962.01.24, reported by Cordiglia brothers in 1962 and later Edwards book. Based on 1959 photo of high altitude equipment tester. Ivanovich Russian phantom cosmonaut. Two Vostok test flights used a mannequin, dubbed 'Ivan Ivanovich'. To prevent confusion by peasants who might think he was a dead cosmonaut or alien, a sign reading 'MAKET' (dummy) was placed under his visor. Mechanical Astronaut American phantom cosmonaut. The MAS was an electronic mannequin that could 'inhale' and 'exhale' man-like quantities of gas, heat, and water vapor. It flew twice - on the MA 3 launch abort 1961-04-25 and one orbit on MA-4 on 1961-09-13. Dolgov Russian phantom cosmonaut, purportedly dying on a Vostok flight on 1960.10.11. The real Dolgov died 1961.11.01, jumping from a balloon from 28 km in a Vostok suit test on 1962.11.01. His visor cracked and he died when his suit depressurized. Grachev Russian phantom cosmonaut, one of two that allegedly disappeared aboard 'Vostok 3' on a circumlunar mission in 1961. In reality multi-manned Vostok would be flown until 1964, and no circumlunar missions until 1968. Belokonyov Russian phantom cosmonaut, reported died in orbit 1962.05.15. Judica-Cordiglia reported radio transmission 1962.11. Named in 1959.10 Ogonyok article on high altitude equipment test. Basis for 1969 novel Autopsy for a Cosmonaut. Ludmila Russian phantom cosmonaut, claimed by Judica-Cordiglia brothers to have died in space in 1961 - or 1963. Healey American fictitious astronaut, featured in I Dream of Jeannie television program. Nelson, Anthony American fictitious astronaut, featured in I Dream of Jeannie television program. Frisbee American phantom cosmonaut. Mysterious tenth member of second NASA astronaut group. The fearless Frisbee was in fact a joke on the NASA press corps created by astronauts Lovell and Conrad. Istochnikov Russian phantom cosmonaut, reported lost aboard Soyuz 2, an unmanned spacecraft that was the docking target for Soyuz 3. Actually an elaborate 1998 modern art exercise by Joan Fontcuberta. Casual Internet surfers took it to be a real person. Mikoyan, Andrei Russian phantom cosmonaut. Story made rounds at ESA in 2000 of two Russian cosmonauts that died in 1969 on lunar landing attempt. Source was TV series, 'The Cape', episode 'Buried in Peace', aired 1996.10.28. Boris Chimp 504 Russian phantom cosmonaut. Fictional lunar landing chimpanzee, subject of Dwayne Allen Day satire of Soviet space history research articles. Yebenov Russian phantom cosmonaut. Moscow urban legend: Apollo 11 astronauts were stranded on the moon. Naked Soviet cosmonaut, stranded sometime before, assisted them in repairing their lunar module. Joke: Yebenov means 'f---d' in Russian. FM-2 Russian phantom cosmonaut. 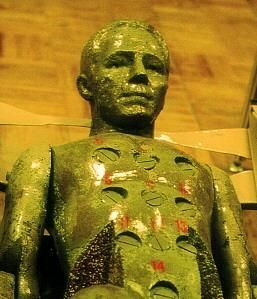 Radiation phantom, instrumented anthromorphic dummy (with Gagarin's face!) used to measure radiation dose rates in circumlunar space. Flew to moon and back on Zond 7, 1969 and in earth orbit on Cosmos 368, 1970. KGB Dwarf Russian phantom cosmonaut. Moscow urban legend of 1970: diminutive robot Lunokhod crawler was actually driven by a midget KGB agent on a one-way suicide mission to the lunar surface. Claggett American phantom cosmonaut. Fictional Apollo 18 mission commander who died on the lunar surface in Michener's novel Space and the resulting television mini-series. Fedrov Russian phantom cosmonaut. 1998 urban legend held that during the fall of Soviet Union, their cosmonauts were stranded on the Mir space station. Embodied on film by character Fedrov in short Norwegian film 'Kosmonaut'. Chen Long Chinese phantom cosmonaut. Phantom astronaut identified as first Chinese man in space in 2003. Mistranslation of Li Qinglong.